From the Home screen, tap or click the User icon (located in the lower-left). 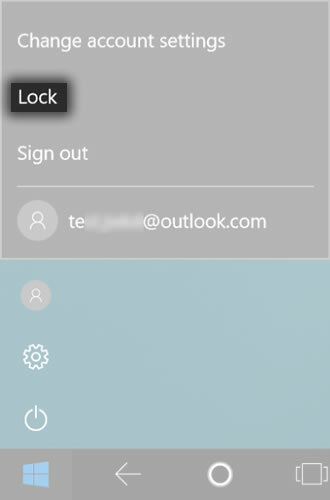 Tap or click Lock (located on the left side of the screen). If using a keyboard, you can also press ctrl+alt+delete then select Lock. If necessary, press the Power button (located on the top left edge). If necessary, swipe up or double-click to dismiss the lock screen. If necessary, select the appropriate user account then enter the password.